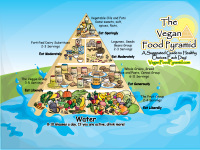 "The Vegan Food Pyramid which you find on this site: Is designed to show a suggested daily intake of food. As you may notice, this pyramid is slightly, at the least, and drastically, at most, different then many other pyramids out there. One difference is the lack of animal based foods. Our bodies do not NEED this to thrive and healthfully survive..."